Back on September 29, 2005, I wrote Retro Toy Flashback 11 about the Space:1999 Amsco Cardboard Playset. You see, back in the 1970s, Amsco and Milton Bradley joined forces to create these very detailed, very sturdy dioramas from popular film and TV franchises. There was the Space:1999 Moonbase Alpha set I featured in that post, the Marvel World superheroes set (which I never owned and now can't afford...) and last but not least, The Planet of the Apes playset. 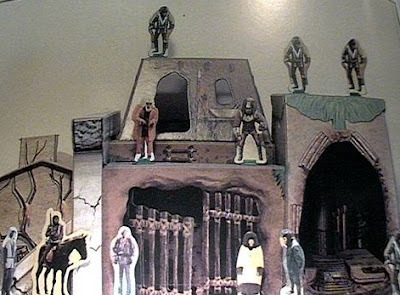 Regardless, this was a glorious, highly detailed set that combined several incarnations of the Apes saga. For instance, there was Zira and Cornelius's house on one side of the set, with a view out the window to the Forbidden Zone and the half-sunken-in-the-sand Statue of Liberty. On the opposite side of the set, there was the grand (two story!) buried cathedral where the mutants worshipped the Alpha and Omeg a Bomb. Here it was called the "Cave of the Doomsday Bomb." Other locales recreated for this toy included "Ape Headquarters," "Villagers Hut," "Underground Ruins" and a "Jail Cage with Moving Doors." The set even included cardboard "figures" of Virdon and Burke - the heroes of the TV series, not the film series. 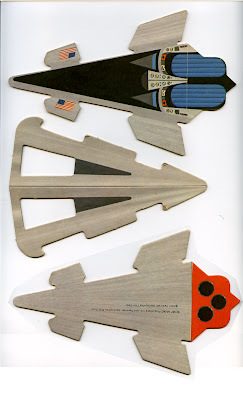 A small cardboard version of the ANSA Icarus spaceship seen in all the Apes films was another item in the set (see photo; right). Although I was already into Star Wars, Battlestar Galactica and Star Trek by the time I got my hands on this set, the Amsco Apes diorama held my attention for weeks, perhaps months. I loved that toy. 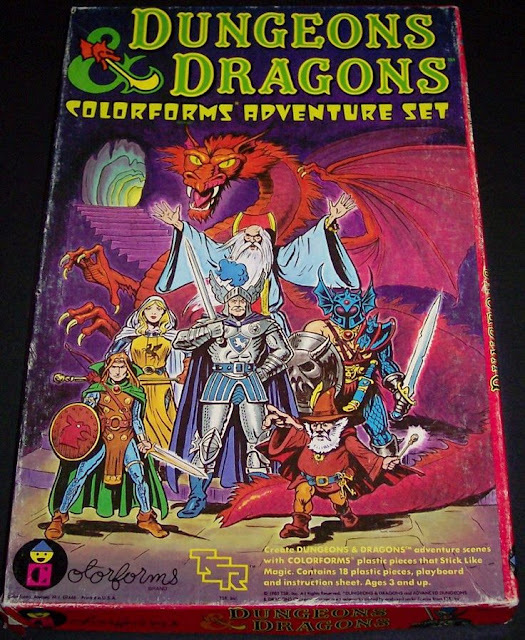 Unfortunately, it did not survive my adolescence (and my messy bedroom closet...) and disappeared permanently somewhere during the dark years of the mid-1980s. 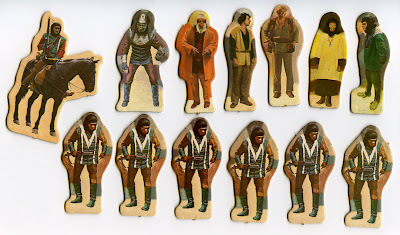 Lo and behold, super collector Jeff Locklear (who sent me those scans of the Batman trading cards last week), still owns his Planet of the Apes Amsco Cardboard Playset and sent me scans of it. Since I no longer own this toy, these photos are the next best thing. I thought it might be fun to update the original post and show you this rare (and valuable) set today. 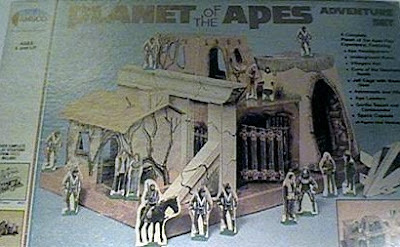 I had this Planet of the Apes set growing up and absolutely loved it. I wasn't lucky enough to have the plastic playset my friend did. But that cardboard one was amazing. It was packed with fun! I wish I had the Space 1999 one (my fave show). My sister had the Walton's cardboard playset!